If you want to buy the first of the relaunched 2020 Ford Mustang Shelby GT500 to roll off the production line, we're sorry to tell you that VIN 001 has already been snapped up. Apparently, the first production Shelby GT500 has been sold at auction for $1.1 million. Even better, it went for a good cause as all the proceeds will go to JDRF – the leading global organisation that funds type 1 diabetes research in an effort to find the cure, which is also one of the charity organisations supported by Ford. The winning bidder was Craig Jackson, chairman and CEO of Barrett-Jackson. The car auction-honcho won the bid in his own yard at the Barrett-Jackson Collector Car Auction in Scottsdale, Arizona – talk about home-court advantage. As the winner, Jackson can choose from available colors and options for the coveted first production-spec Shelby GT500. 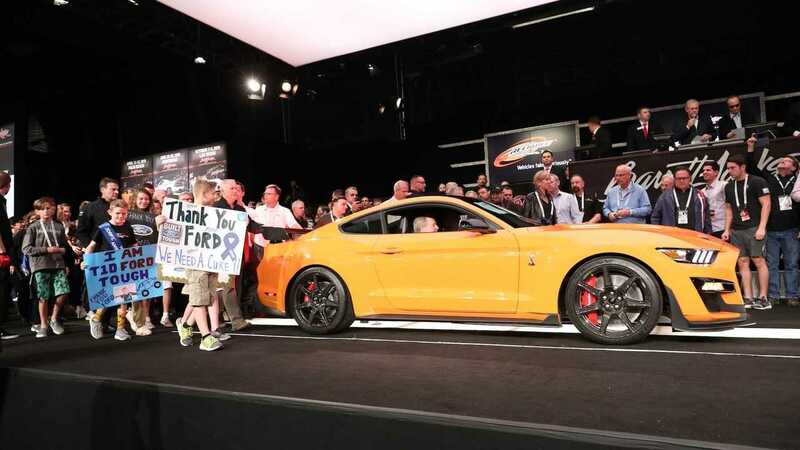 Edsel B. Ford II and Aaron Shelby, grandson of the legendary Carroll Shelby, escorted the 700hp Mustang Shelby GT500 onto the auction block. The VIN 001 was sold at 'no reserve'.